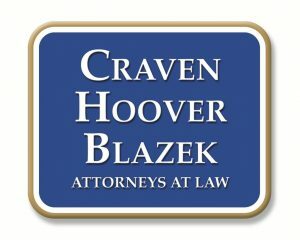 How to Prove Fault in a Slip and Fall Accident | Craven, Hoover, & Blazek P.C. Did you know that if you slip and suffer an injury as a result of the fall on another person’s property, they may be liable for your damages? This is made true under Premises Liability Law. This statute appoints property owners as the responsible party for injuries that take place on their premises. In the case of a slip and fall accident, most often, home or property owners are held accountable if serious injury is endured. In other cases, a property owner might not be at fault even though a slip and fall injury occurred on their premises. It really all depends on the variables and circumstances surrounding the accident. When it comes to proving fault in a slip and fall accident case, the most important objective is to determine if the property owner took necessary and responsible action to prevent such accidents from happening on their premises; or if the victim took necessary responsibility in acting carefully and avoiding expected obstructions. This means that we all have a personal responsibility to “watch where we’re going” and to act carefully. It also means property owners have the responsibility to properly maintain and keep up their premises. In the case that a person slips, but the property owner took necessary action to prevent such accidents from happening, the property owner would not be liable for that person’s injuries. As individuals, the law anticipates us to be able to see or expect danger and obstructions, and carefully avoid them to prevent harming ourselves and others. If someone fails to evince this personal responsibility, they may not be able to pursue a slip and fall lawsuit against a property owner whose premises they fell on. An example would be a woman wearing high-heels on a rainy day and slipping on a person’s driveway. The victim in this case would be liable for their own injuries because they “should have known” better than to wear high-heels on wet pavement, and should have expected slippery conditions as a result of the rain. In the case that a property owner was negligent and failed to provide a safe premises for others, they can most certainly be held accountable for injuries sustained on their property. For example, if a property owner or employee causes a spill, rip, or imbalance that causes a person to slip and fall, they are liable for the victim’s injuries and damages. Also, if a property owner or employee was aware of a safety hazard but neglected to do anything about it, they are liable for a person’s slip and fall injuries. An example of this would be if a homeowner neglected to shovel snow and ice from their walkways in a reasonable amount of time, and a guest slips and falls, they are accountable for that person’s injuries and damages. The law expects a “reasonable” person to fix or repair a safety hazard on their premises. 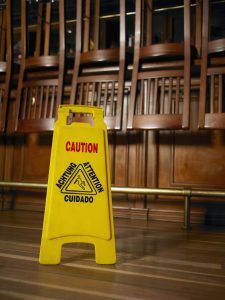 Property owners are expected to post “Wet Floor” signs and other similar preventative actions to warn customers and guest of any dangerous surfaces in order to prevent slip and fall accidents. Victims if such scenarios can then file a slip and fall lawsuit with the help of an Indianapolis Personal Injury Law Firm. Victims can pursue compensation for medical expenses, hospital bills, lost wages, pain and suffering, mental trauma, disabilities, prolonged rehabilitation, and much more. In almost all slip and fall cases, the liability is ultimately decided by a judge, using simple common sense. This is because there is simply no precise way to determine liability in a slip and fall accident. Instead, courts and legal counsels assess the case and decide if the property owner or employees “should have known” about a dangerous surface or obstruction and removed it before an accident occurred. They will also investigate the opposing party’s position and decide if the slip and fall victim was indeed a victim, or if they “should have known” to expect and obstruction or avoid a dangerous surface. It is a very complicated process legally proving fault in a slip, trip, and fall lawsuit. •	Was the Obstruction that Caused the Accident Purposeful and in Place for a Reason? Call Craven, Hoover, and Blazek P.C. at 317-881-2700 if you or a loved one were a victim of a slip and fall accident in Indianapolis, Indiana. Personal injury attorney, Daniel Craven, and his esteemed colleagues and legal team, can recover the compensation you deserve for your slip and fall injuries. We offer free initial consultations to assess your case and determine if you are eligible for remuneration. If we believe you have a legitimate case, we will work fervently to obtain the full and fair compensation you are entitled to for your pain and suffering; and we NEVER collect attorney fees unless we prevail for you! Call 317-881-2700 today and learn more about Indianapolis slip and fall accident claims in Indiana. This entry was posted in Slip and Fall and tagged Indianapolis slip and fall accident claims, slip and fall accident Indianapolis Indiana, Slip and Fall Accidents, Slip and Fall Cases, slip and fall injuries. Bookmark the permalink.